The holidays are rushing toward more and more quickly each day. My family was here visiting for Thanksgiving for a few days, and the next thing I knew it was a third of the way into December. Usually, the Christmas season is a flurry of activity for me. I'm tracking down presents for friends, scrawling notes on cards, and baking up a storm- pumpkin bread for the teachers, cookies for the neighbors, and treats for visitors. This year has been busy, but not in quite the same way. Usually the December hubbub is thrilling and enjoyable. This year, however, I feel stressed and out of sorts. Being away from home has made it harder to get into the swing of things. I have only a small window of time between classes to pop into Bonkers or the Christmas Shop. I've strung up a bit of garland around my bed and above my window, hung a stocking, and cracked open an advent calendar. I even bought Christmas tree-scented air freshener to help get me in the mood. Bing Crosby and Frank Sinatra have been crooning from my computer, telling me that it is, in fact, beginning to look a lot like Christmas. The ground is still coated in a lovely layer of snow, and the air is crisp and fresh. Everything is screaming, "IT'S CHRISTMAS!" Don't get me wrong. I still get giddy when I think about waking up on December 25th to the delicious scent of cinnamon buns baking in the oven and the warmth billowing through the house, both drawing me down to the tree. As much as I like getting presents, I love to give them even more. One of my very favorite things to give are baked goods. What could be better than opening up a box of freshly baked sugar cookies or unwrapping a tasty loaf of gingerbread? A tin of truffles, of course. These are decadent and rich. And unbelievably delicious. You can customize them depending on the lucky person you are giving them to. 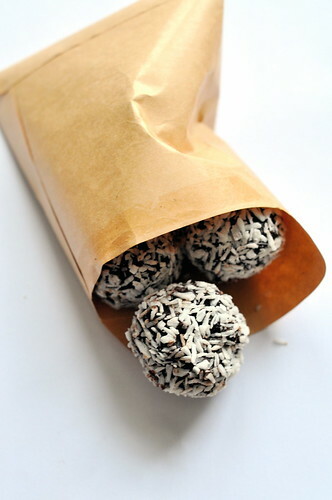 Roll them in coconut. Dust them in cocoa powder. Sprinkle them with chopped pistachios. Anything goes. Just make them and share them, but be sure to sneak one (or two) for yourself. Put the chocolate in a heatproof mixing bowl. In a small saucepan, combine the cream and honey and heat to barely a simmer. Pour the hot cream mixture over the chocolate and stir quickly with a rubber spatula until the chocolate melts. Add the butter and mix until it is fully incorporated. Put the bowl in the freezer to allow the ganache to set; it should be firm but still scoopable. 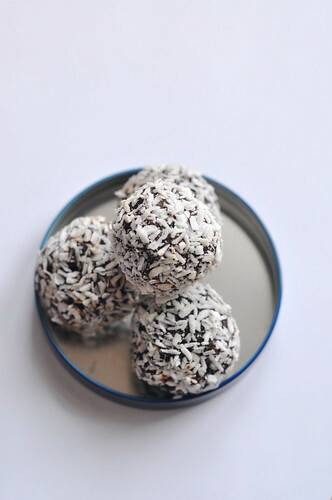 Remove a spoonful at a time and roll each piece between your palms into a small ball. 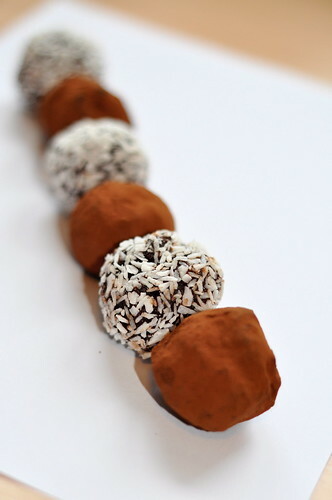 Once the truffles are shaped, place the coatings in small, shallow bowls and roll each truffle in the cocoa coating evenly. 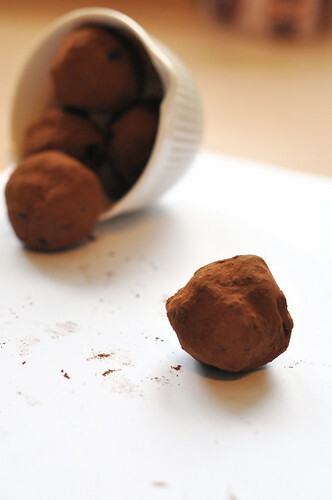 The truffles will keep in an airtight container in the refrigerator for about 2 weeks.